Battle at Stoney Creek, 1813. Artist: Jefferys, Charles William, 1869-1951. 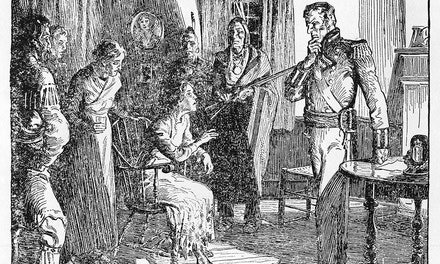 The spring of 1813 was a time of gloom and disaster in Upper Canada. The war with the United States pressed heavily on the country. Brock, the inspiration of its defence, had been killed at Queenston in October. York, the capital of the province, had been captured. Fort George and Newark had fallen to the American invaders after a severe engagement, from which the British force had extricated itself with heavy losses. 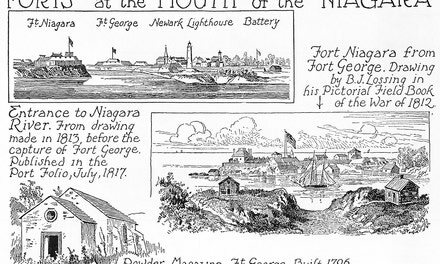 The Niagara frontier lay open, while the Americans were preparing to advance from Detroit. The British centre army had fallen back and entrenched itself on Burlington Heights, within the limits of the present city of Hamilton. Early in June three thousand American troops under Generals Chandler and Winder pushed forward in belated pursuit of the British. They marched westward along the road which ran parallel to the lake, beneath the ridge which extends from Queenston to Burlington. By the evening of the fifth they had reached the little stream known as Stoney Creek. On its eastern banks, the American army made camp for the night. Pickets and sentinels were posted in the woods and in a small meeting-house to the west, and four field guns were placed in position to command the road, which led through the centre of the camp. The approach of the Americans had been observed by the British scouts and word was quickly carried to General Vincent at the Heights. Just before dark Col. Harvey, his most efficient officer, reconnoitred the American position and planned a night attack. At midnight seven hundred and four men selected from the 8th and 49th British regiments set out on their march to surprise the Americans. The night was intensely dark and the men moved in profound silence along the forest road. The sentries were surprised and killed or captured without noise, and the attacking force burst upon the sleeping camp. In the light of the smouldering fires the redcoats were plainly seen. The Americans recovered from their surprise and began to fire upon the exposed British force, and the artillery was preparing to sweep the road. The attack was in danger of failure, when Major Plenderleath, leading his men, charged at the guns in the centre. The rest of the troops dashed up the slope with a cheer and fell upon the Americans with the bayonet. The two generals, Chandler and Winder, were both captured, and their troops scattered. The British withdrew before daylight exposed the smallness of their number, carrying off two of the guns and a hundred prisoners. The Americans broke up their camp, and retreated hastily toward Newark. On their march the British fleet on Lake Ontario bombarded them and captured their supply boats, while Indians, regulars and militia harassed them from the ridge, and closed in on them behind. Their retreat continued until they were sheltered by the guns of Fort George. Later in the month another American expedition met disaster at Beaver Dams. For the rest of the summer, the invaders were cooped up within a narrow circle around Newark and Fort George, disturbed by raiding parties of British and militia and Indians, and wasted by increasing sickness. 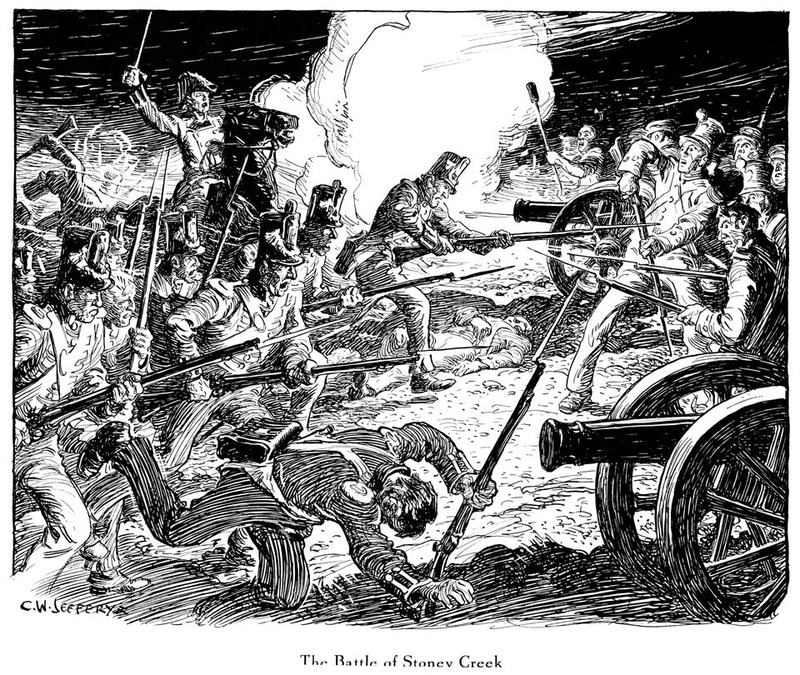 The night attack at Stoney Creek had turned the tide of invasion for that year. 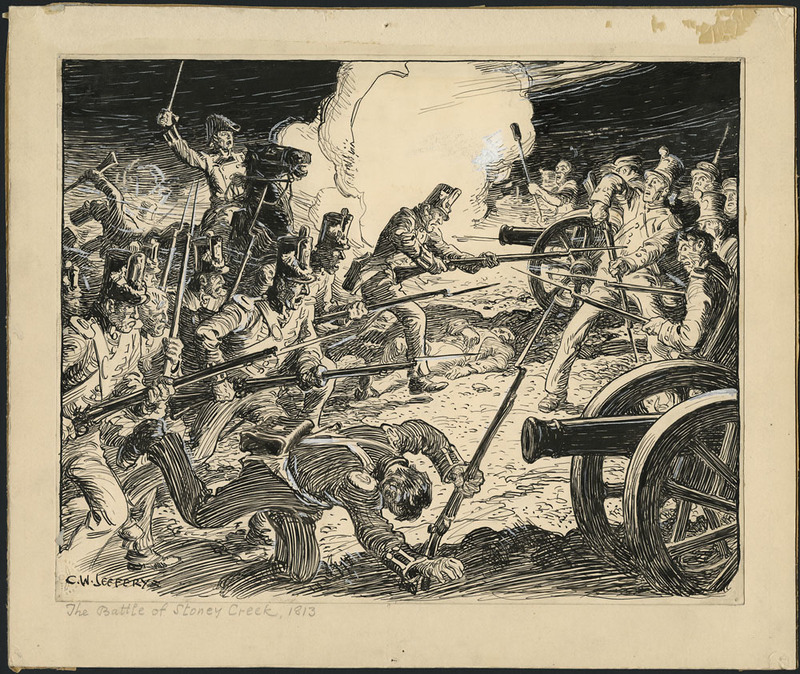 The illustration depicts the charge upon the guns. The British wear red cutaway coats with short tails, with white braid across the breast at each button, and on the cuffs, which, together with the collars, are dark blue. Their shakos are black, with a white cord looped along the peak in front and gathered at the sides, where it terminates in a pair of tassels on the right and a red and white pompom on the left. Their grey trousers reach to the ankles, where the seams are split, showing black gaiters beneath. White cross belts with a brass number plate at their intersection support their cartridge pouches and bayonet scabbards. The Americans are dressed in short-tailed blue coats with white braid, and white or blue trousers. Their infantry hats are somewhat bell-crowned, with a white ball at the front of the flat top. The artillery wear low-crowned caps with a deep peak. and short blue jackets without tails. “We did win that battle.” In [Toronto Telegram? ], ca Feb. 1961.